Cut out fennel core and slice the bulb into thin strips, reserving any fronds for serving. Halve cherry tomatoes and set aside, along with the fennel. To make the olive tapenade, pluck rosemary leaves from the stems, chop, and add to a bowl with anchovies, olives, and half of the olive oil. Chop garlic and add half to the bowl, setting aside the other half. Season with pepper and blend to a smooth paste. Toast fennel seeds briefly, until fragrant, in a frying pan set over medium heat. Add the remaining olive oil to a pan and sauté the sliced fennel, cherry tomatoes, and remaining chopped garlic for approx. 3 min. Season with salt and pepper. Pour in the sugar and deglaze the pan with the white balsamic vinegar and crushed tomatoes. Let reduce over low heat for approx. 5 min. Meanwhile, place a pot of water (about ¼ of the way full) on the stove to simmer. Line a sieve with parchment paper. Salt the cod fillets and place into the lined sieve. Set the sieve over the pot and steam cod, covered, for approx. 5 - 8 min. or until cooked to your desired doneness. Spread a layer of the olive tapenade onto each fillet and remove from heat. 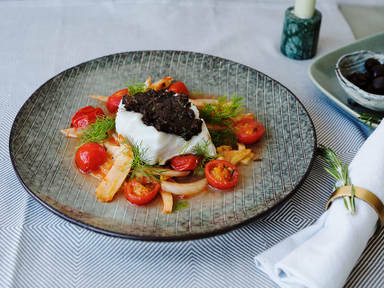 Spoon the braised fennel-tomato salad onto plates, place the cod fillets on top, garnish with fennel fronds, and enjoy!